Fatigue is a drag. It boosts anxiety, temper and weight. It spoils relationships with friends and family, drains creativity and finances and somehow manages to keep us wide awake at night. Fatigue steals away our youth and our happiness. Isn’t it time to eliminate fatigue and love/enjoy your life again? YES it is! We can help. “We” is the Fatigue Be Gone Guide & LOG eBook Bundle written by Viveca Stone-Berry, former fatigue sufferer. The bundle offers a step-by-step self-discovery and fatigue recovery guide for women who are sick and tired of feeling tired all the time. Fatigue Be Gone GUIDE is a simple, yet powerful tool to overcoming adrenal fatigue. It includes questionnaires you can fill out and take to your doctor, daily energizing practices, list of energizing foods, health tips, recipes and more. Fatigue Be Gone Log includes a food diary, energy and activity log, weekly notes and observations, and tools you can use alongside your healthcare provider to help them better understand your personal situation. Want to recover from fatigue yourself (or help a friend), but don't want to spend a small fortune on lab fees, over-the-counter remedies and specialists? Easy re-energizing practices that you can incorporate into your day to help you sleep better, eat better, eliminate anxiety and feel better - FAST. Doctor's appointments, shopping for remedies, and scouring the Internet for answers is expensive and time consuming. For someone sick and tired from fatigue, getting better can easily seem like too much work! The Fatigue Be Gone Guide can help you find the answers you need NOW. For less than the cost of dinner, you can have the answers you are seeking. And you can have them instantly. ​ Click here to buy now. Energy & Activity log in checklist format. Simple to use and helps you stay-on-track. Food Diary helps you identify energy highs and lows and potential food fatigue “triggers” so that you can clear them OUT! Weekly “Notes and Observations” Diary pages help track energy highs, lows, observations and accomplishments. Introduces and integrates easy energy boosts and healthy eating habits that can work to maintain your gains. Presents “best of” information and recommendations from years of research, trial and error. Tool you can use with your healthcare provider. The more you know about yourself - -how you are feeling and when- - the easier and faster it may be for them to help you go all-the-way to feeling GREAT! Fatigue Be Gone Guide is an instant download product. Within seconds after submitting payment, you can sit down, prop your feet up and discover how to feel better. And, it's backed by my 30-day 100% Satisfaction Guarantee. If for any reason you feel The Fatigue Be Gone Guide doesn't provide you with the answers you are seeking, simply request a refund. All I ask is that you give it a go for 30 days. Take the quiz and share the results with your doctor. Test drive the recipes and try out the tips. Then make your decision. 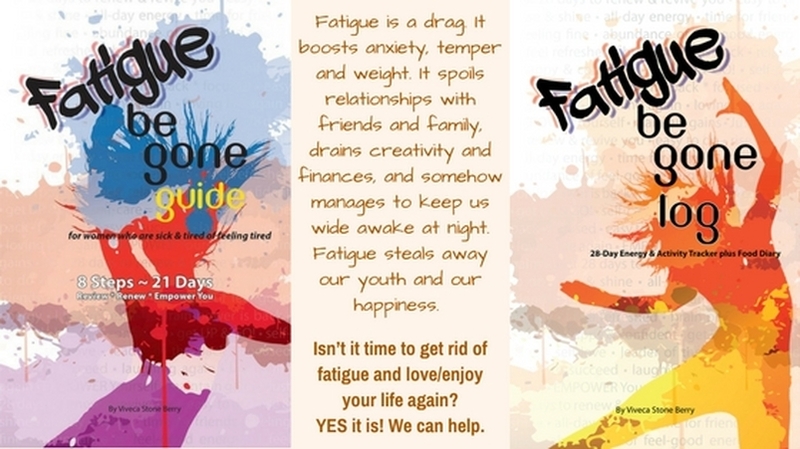 ​Fatigue Be Gone Guide and Log can be purchased separately or as a bundle.